Adobe Dreamweaver CS5.5 - Design, develop, and maintain standards-based websites and applications. Build world-class websites and applications with one of the industry's leading web authoring tools. Adobe Dreamweaver CS5.5 software is ideal for web designers, web developers, and visual designers. New features let you preview and test web content twice as fast; Clients can quickly and easily edit their pages with Adobe InContext Editing,etc. ...... in a browser. Using Live Code, you see the results of coding changes in Live View more than twice as fast as you would switching to a browser. In addition, you can click a related file to see both its source in Code view and the parent page in Design view. With InContext Editing, you can define editable regions in your web pages that almost anyone can edit directly from a browser, without any additional software. InContext Editing preserves your design integrity, while saving you time. * Migrating from Adobe GoLive software to Dreamweaver? 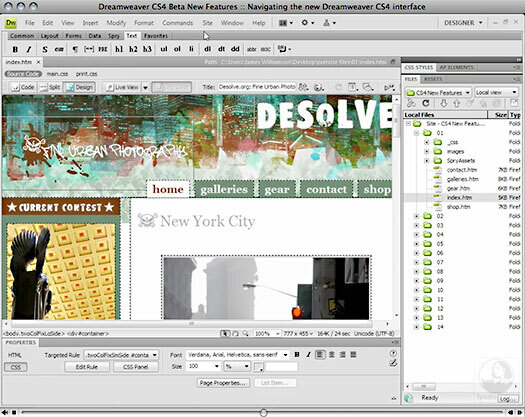 This training video from lynda.com offers tips on performing common GoLive tasks in Dreamweaver. You can create and edit HTML, PHP, ASP, JSP, CSS, XLST and other web files. Convert Audio Files and Play Audio Files. Qweas is providing links to Adobe Dreamweaver CS5.5 11.5.1 as a courtesy, and makes no representations regarding Adobe Dreamweaver or any other applications or any information related thereto. Any questions, complaints or claims regarding this application Adobe Dreamweaver CS5.5 11.5.1 must be directed to the appropriate software vendor. You may click the publisher link of Adobe Dreamweaver on the top of this page to get more details about the vendor.